The annual exhibition of jewelry and timepieces held in Basel, Switzerland - plays a leading role in setting worldwide trends in jewelry circles. The participating exhibitors must first pass a set of strict screening procedures. The world's best-known jewelry firms and many famous observers attend the Basel showing. The exhibits this year were divided into four showrooms, one of which was the Asian Hall. The unrivalled celestial jewelry designed by Supreme Master Ching Hai attracted both jewelry professionals and the audience, and induced them to linger. Some people even came back to the booth after they had just quickly passed by it. They appreciated each of the art pieces, as if they were digging out a great treasure from under the ground. The more they looked, the more beauty they discovered and the more they understood the meanings represented by the celestial jewelry. One Indian jewelry company came to visit us on the day before the exhibition. They were very surprised and curious about the design of the celestial jewelry. It seemed that they had never seen such unique, sophisticated designs and quality manufacturing. Before the exhibition we distributed several hundred invitations among famous jewelry designers, political and business people, and the media, in order to reach more people with the affinity to know a Living Master through the fine arts. We held four news conferences on the subject of "Beauty and Its Relationship to the Celestial World," and during our stay in Basel, Master was personally present at each of the conferences. 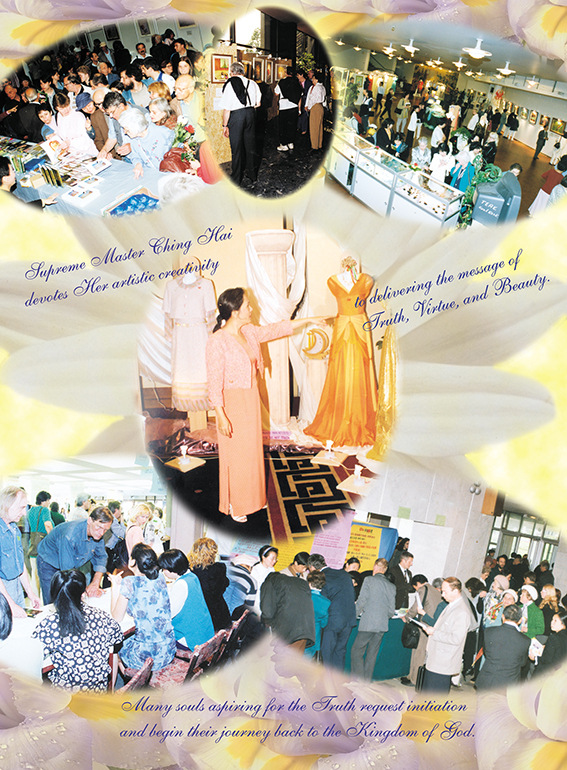 At the first conference, many chief editors and journalists from jewelry and fashion magazines were represented, such as Europa Star International Jewelery magazine; news agency, Zurich; "World of Watches and Jewelry" from Lebanon; the Information Center of the United Nations, London; "Jewelry News Asia" of Hong Kong; "Bijoux Magazine" of Brussels; the Italian Federation of Silversmiths; Italian Gold Magazine; HR magazine; "Lifestyle" magazine, Vienna; "Currents" magazine, Miami; Vietnet Television, Switzerland; Miller Freeman Asia Ltd. Hong Kong; "Carat" International Magazine; Vogue" and "Gioiello", Milano. Dressed in pure white, Master looked very noble and fresh. She attracted everyone's eye with Her kind smile and humorous yet elegant speech and manner. The feelings She generated seemed like a soft breeze under the bright, warm spring Sun. She explained the true meaning of the celestial jewelry. The gold and jewelry are actually just dust to us, and not even worthy of being mentioned, She said. However, in this physical world these shining materials can be used to wake up our true inner self and make us remember our glorious Home. During the second conference, many dignitaries gathered. The audience also included the ambassador from Israel, Mr. Mayer and his wife, the ambassador from Indonesia, Mrs. Tati S. Darsoyo, and jewelry designers and business people; as well as the organizer of the exhibition. At the beginning, we provided them with a brief biography of Supreme Master Ching Hai and a description of Her recent charitable acts involving disaster relief by showing them a videotape. 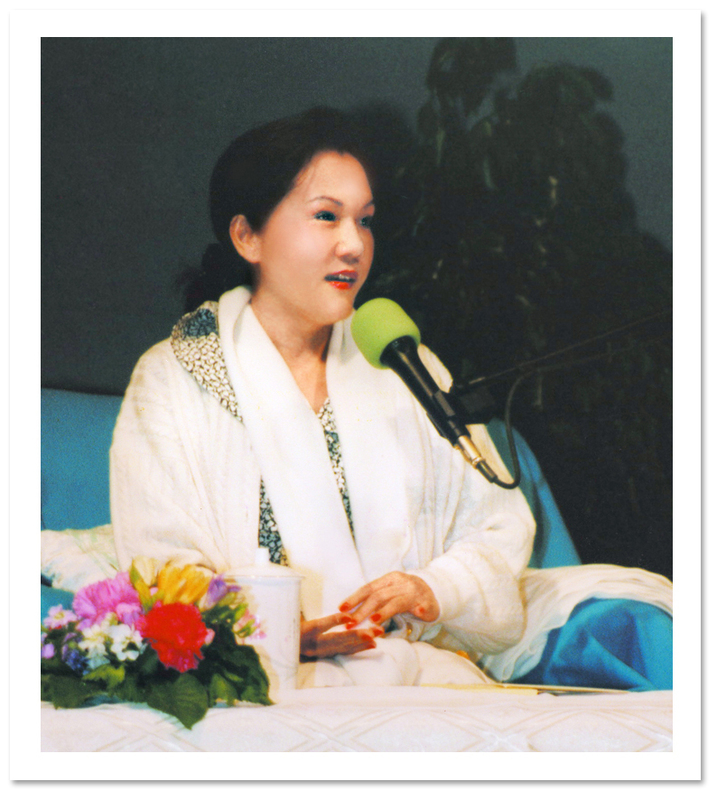 The tape explained that Supreme Master Ching Hai offers the money that She makes from Her celestial jewelry to needy people around the world. Then we played the videotape that briefly introduces the 9th generation of celestial jewelry designed by Supreme Master Ching Hai. The visitors not only admired the jewelry, but also highly praised its designer, who has such high and noble ideals and a great, compassionate heart. The wife of the ambassador from Israel is an artist, and also designs jewelry. Before leaving, the ambassador from Israel told us that he loves the 9th generation celestial jewelry very much because it is so perfect. He had the greatest esteem for Master's great love and kept saying that She is a really great Master. The ambassador from Indonesia exchanged opinions and discussed many questions with Master. The ambassador said that this news conference gave her a beautiful and deep impression. She was very glad to have been able to attend the conference. Other jewelry designers and busineAt the third conference, the following organizations were represented: the Hong Kong Jewelry & Trade manufacturers Association; the Hong Kong Trade Development Council; the Federation of the Swiss Watch Industry; a geochemist working for Development and Environmental Management in Zurich; and Mr. Yun-cheh Huang, general director of the Cultural and Economic Delegation of Taipei, in Bern. After watching the video introduction, the audience, to our surprise, asked many questions about spiritual practice, each of which Master answered. An Indian jewelry businessman was very lovely. He listened very carefully, smiling all the time from the very beginning of Master's talk, and frequently nodded his head to agree with Master. He seemed intoxicated in Master's infinite love and reluctant to leave even after the conference had ended. The fourth conference was held in Geneva. Dressed in a noble white gown, Master circulated among the guests and greeted everyone in a kind way. Her humorous talk made people laugh repeatedly. The ambassador from Albania and his wife (Mr. & Mrs. Vladimir Thanati) came, along with representatives from the Red Cross and "Medicins sans Frontieres". A very nice Iranian lady who had wanted to meet Master for a long time had flown into Geneva from the other end of Switzerland on very short notice. In addition, a "film-star" who had met Master in the hotel lobby, also come along with Master. Master thanked the delegates of the humanitarian organizations for the good job they were doing and gave them encouragement to continue. The ambassador from Albania said to Master that he has the greatest esteem for Master's charitable acts. Recently, more than 400,000 refugees have fled to Albania, a small, very poor country that cannot cope with this influx. Organizing the basic necessities for so many people took a great deal of time and effort, as many of them were in areas that were very difficult to reach. The government of Albania thus was feeling much pressure, and he hoped to get Master's blessing and help. After listening to the ambassador, Master showed Her concern about the situation and asked him to provide us with more information. Master said that She would do Her best to help Albania get past this difficult time. (In accordance with Master's instructions, The Supreme Master Ching Hai International Association offered US$50,000 to Albania through the Red Cross in order to comfort the refugees. Please see attached receipt and letter 1 & 2). Master said that we'll send more financial help as needed. Then, many of the guests contended with each other to get an opportunity to discuss spiritual practice with Master. They asked for Master's advice and suggestions on questions that had been hidden in their hearts for a long time. Master answered every one of their questions to satisfy the longing of their souls. For the jewelry designers and business people, the jewelry exhibition is a place where they present their best designs and display their products. Through the celestial jewelry, Supreme Master Ching Hai not only showed the glory of Heaven and the beauty of the soul, but also distributed the seeds of love and wisdom, as well as cementing many good affinities with sentient beings. Her love and the longing of sentient beings seem not to allow Master any breaks. Right after the four news conferences, the very next morning, She flew to Spain to begin Her European lecture tour, which included talks in 18 countries in a period of 35 days.